Ah clutter. The bane of every home. 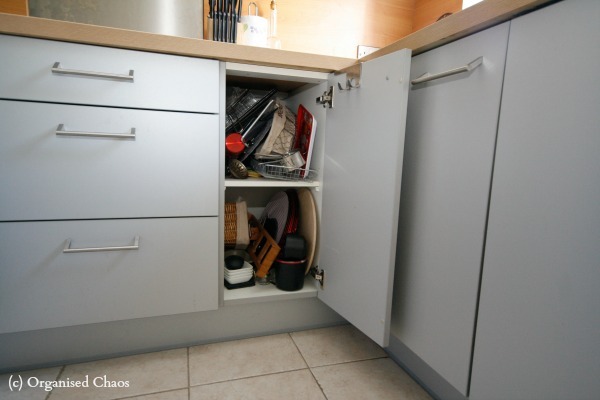 Whether you want to admit it or not, most homes have clutter somewhere. I have clutter. Granted, I have a lot less clutter than most, but that doesn’t mean my kitchen cabinets don’t need some work on them. That cabinet has been like that for ages. I haven’t had the chance to clear it. Now you guys have seen it though, I’ll have to work on it and write a blog about it! #Motivation! Sure even the most organised person on TV, Monica Gellar in Friends, had clutter. Remember this? I work a lot helping clients reduce clutter and everyone is quite embarrassed by it. It’s understandable. We would all prefer not to have it, or have a lot less of it. Sure even adding that photo of my kitchen cabinet above makes me squirm. But I think we all need to give ourselves a break. It’s the notion of ‘perfection’ that’s making us all feel inadequate. Life is busy. Sometimes our house takes a hit. When clutter really starts building up, you start losing flat surfaces and particularly your floor, then yes, you need to do something about it. Clutter is very oppressive. I am convinced it’s not good for our physical, mental and emotional wellbeing. The dust that can accumulate with it alone is not good. And the “visual noise” as one client put it, from looking at clutter day in day out, causes more emotional stress than we even realise. It’s only when you start to get rid of it or assign proper homes to objects, that you realise just how much of a weight that clutter was on you. Clutter essentially comes from deferred decision making. But WHY do we defer the decision? We either need to give it a home or get rid of it. But WHY is this so hard to do sometimes? To figure this out, it’s important to take a look more in-depth at what Clutter really comes from. Look at the 7 main reasons I come across why people keep things. Do any of them strike a cord with you? Look at these questions and see if any of them strike a cord with you? Do you keep an item because of how much it Cost? Do you keep an item that was given to you on Loan? Do you keep an item even though it’s Unworn or Unused? Do you keep an item because for you, it’s a Treasure? Do you keep an item because you didn’t have Time to get rid of it? Do you keep an item because it brings up a lot of Emotions? Do you keep an item even though it’s Rubbish? In some instances, keeping an item because of some of the above reasons is fair enough. However, 90% of the time, I find that these reasons above are more akin to excuses. The REAL reasons the items stay is because of how they make us feel. They don’t make us feel good. So the REAL reasons are the uncomfortable feelings or emotions we get from the items. These uncomfortable feelings make us say “oh I’ll look at that later” or “I’ll just leave this here for a moment” or “I’ll come back to it”. Lo and behold the decision is deferred. And if this is done often enough Clutter builds up. So it’s really good to take a more in-depth look at what exactly is Clutter. What type of clutter is in your home. It needs a decision on it. Either it goes to charity, it goes in the bin, or it stays and is given a proper home. By looking at clutter in this way, it might help us make decisions more easily and quickly.